All-Abilities Media — one of Pittsburgh’s leading efforts for teaching young adults about media production — is teaming up with the Center for Media Innovation at Point Park University to offer workshops in March and April, 2019. Curriculum includes the opportunity to record and publish a video interview. My 23-year-old son, Mark Steidl, has participated in All-Abilities Media for the last two years and has enjoyed the experience. All-Abilities Media Project Director Jennifer Szweda Jordan is a terrific teacher and mentor. I encourage anyone who has an interest in learning more about audio-video production to look into this unique opportunity. Panel 1: People with Developmental Disabilities & Employment Changes-What still needs to happen in Western Pennsylvania? Funding for this event provided by the Edith L. Trees Charitable Trust. Support also provided by ACHIEVA; the United Way of Southwestern Pennsylvania, 21 and Able Initiative; and the Institute on Disabilities at Temple University. Accessibility: ASL interpretation will be provided. Other accommodations available upon request. Please request by contacting Mary Hartley at info@wpdhac.org or 412-204-7199 no later than October 9th. Parking is available in the free lot and the location is close to major bus lines. Recently, I wrote an article for Public Source about local disability rights activists’ decades-long advocacy for solutions to the Pittsburgh’s “one-step” problem — that is, the single step that prevents wheelchair users from entering many businesses in city neighborhoods. Colton Vazquez with his acceptance letter from Slippery Rock University. Recently, I wrote an article about “inclusive higher ed” programs for Public Source, a digital publication that covers the Pittsburgh region. The focus of the article is Colton Vazquez, a senior at Pittsburgh Allderdice High School, who has decided to attend the “Rock Life” program at Slippery Rock University. I first heard about Colton’s college aspirations last year when his mother, Candy Vazquez, posted on Facebook about their visits to Slippery Rock, Millersville and E. Stroudsburg in Pennsylvania, as well as Western Carolina and the University of Central Florida. 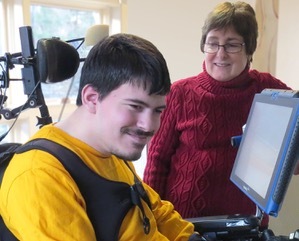 Having taken my son, Mark, to see Millersville’s inclusive program last year as well, I was curious about Colton’s journey. The number of inclusive higher ed programs is growing in Pennsylvania. There are now ten (see complete list in article). A decade ago, there were two. Each program is a little different from the others. Most are defined as non-degree programs for students with intellectual or developmental disability. The Think College website is the national resource for these programs. In Pennsylvania, the Dream Partnership and PA Inclusive Higher Education Consortium are the go-to’s for info. As parents of a young adult with significant disabilities, one question is never far from our minds: What will our son’s life be like when we are gone or simply unable to participate in his care? Mark is 22 and has cerebral palsy. He has many abilities as well as disabilities and medical conditions that require one-on-one support. My husband and I — both of us in our 60s — are the primary caregivers. Habilitation aides and nurses also provide support several hours a week.